Badness and Sadness on the Superhero Superhighway. It’s like that rock star yell: “Are you having a good time?” And despite the mistakes, the bad harmonies, the hot sweat, the elbows in your groin, you scream back, “YEAH!” Because the energy of the performance and the sincerity of your heroes make the journey worthwhile. GUARDIANS OF THE GALAXY VOL.2 captures that same spirit of eager fire and innocent fun it broke over us so brilliantly in its predecessor. This sequel might be some kind of masterpiece, but we hardly notice, as we ogle at the bombastic spectacle and vibrant colors, sassy characters and outlandish acrobatics, as the Guardians once again save the galaxy from a malignant evil. 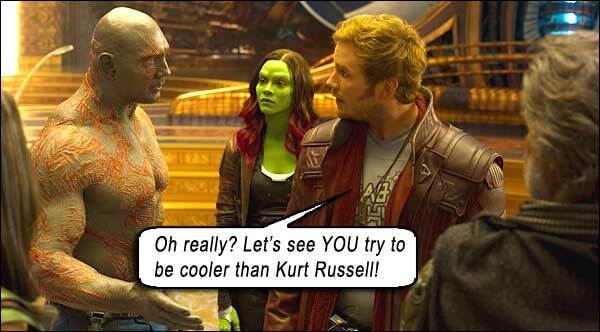 All the principals reprise their roles from the 2014 original: Chris Pratt returns as Peter Quill (aka Star Lord), the affable Earth native with the ambiguously galactic birthright; Zoe Saldana is green-skinned Gamora, rebel daughter of Thanos; Dave Bautista is Drax, the mauve-muscled alien with no social filters; Bradley Cooper is the voice of Rocket, the raccoon-shaped weapons expert, and Vin Diesel gets his voice pitched-up for 10 lines as Baby Groot the tree creature. No matter the stakes, no matter the danger, no matter the sacrifice, the Hero Pose MUST be performed. 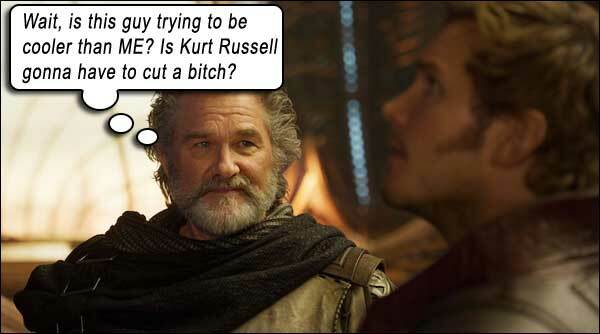 It’s KURT RUSSELL! In his THIRTIES! When the blue squid’s crest is up, he’ll mate with anything– sorry, I’m thinking of Dr. Zoidberg. While Rocket fixes Quill’s busted ship (named the Milano, yes, after Alyssa), Ego transports Quill, Gamora and Drax to a planet named Ego. The embodiment of his will, where the strains of George Harrison’s My Sweet Lord only add to the LSD swirl of the sinfully toxicolorful planet. And there Ego explains how and why he got biblical with Quill’s mother. In the event of grown men weeping like babies, fast forward to Action Posedown. And that’s where this movie kicks us in the weeping nerve time and again. Somehow, writer-director James Gunn hits home run after home run with each seemingly shallow, boisterous character. He underpins every emotional scene with a classic rock soundtrack that transports us directly to Full Weep. Quill lamented he never knew his real father, had no one to play catch with, and here, on a distant world, he finds his inner child. 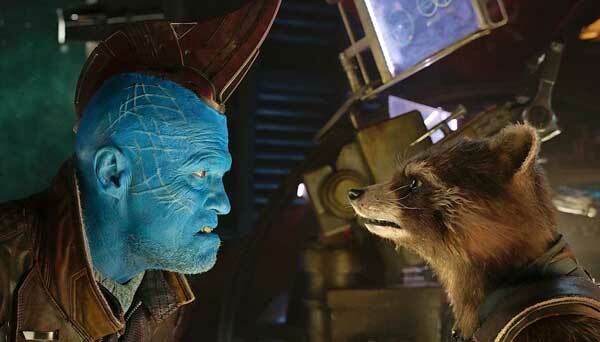 Michael Rooker returns as blue-skinned Ravager Yondu, who took in Peter Quill as a boy and showed him the ways of the Colorful Pirate, now shunned by the Ravager community (including Sylvester Stallone as Ravager Stakar); on the periphery of the storyline, he would become its focal point for its message of heart over head. Victim of a mutiny, he and Rocket end up as prisoners sharing a cell, and in a heated exchange that seems to tip into serious hurtful insults, we are as shocked as they are when we discover the core of their pain, and realize they share similar pasts (slavery) and deal with it the same way (isolation). Thus, Yondu – a certified baddie in the first film – graduates to badass, as he and Rocket (with Baby Groot tagging along, in a tiny spacesuit) stride out of the cell in Hero Redemption Slomo, his whistling arrow tearing through the mutineers, over Jay and The Americans’ Come A Little Bit Closer. Nebula and Gamora forge an uneasy sisterly alliance against their father, after a badass battle of Girls Gone Spacewild, while literal-minded Drax will find a few moments of empathy with an empath, Mantis (Pom Klementieff), Ego’s concubine. And even Quill and Gamora eventually admit there IS an “unspoken thing” between them. Writers: James Gunn, Dan Abnett, Andy Lanning. Starring: Chris Pratt, Zoe Saldana, Kurt Russell, Dave Bautista, Vin Diesel, Bradley Cooper, Michael Rooker, Karen Gillan, Pom Klementieff, Sylvester Stallone, Sean Gunn, Elizabeth Debicki, Chris Sullivan, Tommy Flanagan, Laura Haddock, Evan Jones, Steve Agee, Stan Lee, David Hasselhoff.